Long-term stock investing is the type of trading that most people are familiar with because it is the type of buy and hold investing that is used by the non-trading public. Long-term stock investors typically purchase stock in a company that they have confidence in, and then wait for the stock price to increase (i.e. they buy, and then hold the stock, no matter what). What most long-term investors don't know, is that this type of trading requires the highest margin, and is one of the riskiest ways of investing in stock. A much better way of investing in stock is to use stock options, which have a much lower margin, and limited risk. There are two main advantages of using stock options to invest in stock. Firstly, stock options cost much less than the actual stock, so the amount of margin required is much lower. 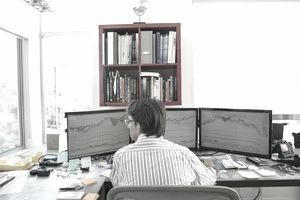 This means that traders with smaller trading accounts can invest in stocks that would otherwise be out of reach and that traders can have more trades active at the same time. Secondly, the risk of a long call option is limited to the amount paid for the option, so the risk of the trade is limited and known in advance. When most long-term stock investors are still holding their stock when it is down by $10,000, an options trader may only be down by $3,000, with no further risk regardless of how low the stock price goes. Buy 10 call options (each options contract is worth 100 shares), with a strike price of $420, at a cost of $15 per options contract. The total cost of this trade is $15,000 (calculated as $15 x 100 x 10 = $15,000). The cost to buy the equivalent number of shares in the underlying stock would be $420,000. Wait for the stock price, and the options' price, to increase. If the stock price of XYZ increases to $450, the call options' price will increase to approximately $30. The amount of increase of options depends upon how far in the money the options are. The farther in the money the options are, the closer the increase will be to a 1:1 ratio. Sell the 10 call options at a value of $30 per options contract. The total amount received upon exiting the trade is $30,000, which is a profit of $15,000. The total profit that would have been realized if the trade had been executed using the actual stock would have been $20,000, but before you start complaining about the missing $5,000, read the next paragraph about the risks of this trade. The risk of the options trade is limited to the amount paid to buy the call options (when entering the trade). Whereas, with the actual stock, there is no limit to the risk of the trade (i.e. the entire investment could be wiped out). If the stock price of XYZ had decreased to $400 (or even lower), the options trade would only incur a maximum loss of $15,000 (the initial cost of the call options). With the actual stock, the loss would have been $30,000, or more if the stock price had gone down even further. If you are considering investing in a stock, think about using stock options instead of the underlying stock. Using stock options in this manner can considerably reduce the risk and potential loss of investing in stock. This can significantly increase your risk to reward ratio, and thereby your profitability.